Happy Monday everyone! Shannon and I were actually in the same state this weekend. Our cousin Katie had her baby shower on Saturday so Shannon made the drive down to NJ. It was a lovely day, but I think we are both still exhausted (tons of presents to haul!). 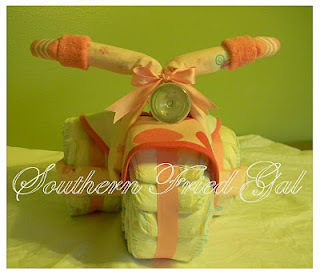 For the shower, I decided to try my hand at make a diaper trike instead of the usual diaper cake. 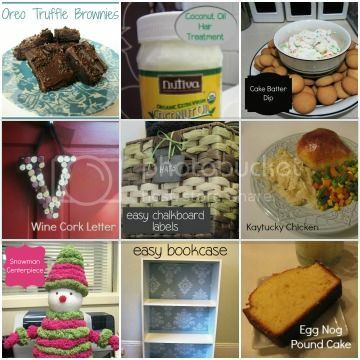 I found repinned this image a long time ago and its apparently a link to buy one. I pretty much followed her instructions word for word. I made the wheels out of rolled up size 1 diapers (15 each for the back wheels, 25 for the front). Then I wrapped some ribbon around the rubber bands and secured them with a safety pin. Then I pulled one of the security blankets through the middle of the front wheel, and around the outside of the little wheels and through them. My blanket was a bit short so I had to use safety pins to bridge the gap and connect them. Short blanket meant more safety pins. Next it was on to the fun stuff - arranging a couple bibs for the fender and seat, using a bottle as a headlight, and then securing it all with the second security blanket. A couple of socks as handle bars, so ribbon to cover the rubber bands, and its done! I cut a piece of foam board to put it on and wrapped the whole thing in plastic, but we decided to put it on the table unwrapped as a little more blue on the candy bar. Isn't it cute? The handle bars sort of slumped sometimes, I think the bottle was a little fat. The Verdict: It was pretty simple to make, and I think it was a hit. 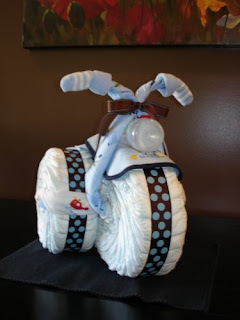 As I said, its a nice alternative to the diaper cake. It took me a couple tries to get the wheels the way I wanted, but it only took an hour or so for the whole thing. Things to Note/Consider: Either I had short blankets, or the size 1 diapers were a little too big. For both the one blanket to secure the wheels and the other to make the handlebars, they were a little too short. I wound up using an extra pair of socks in the handlebar socks to fill them up a little. Other than that, the directions and photos from Southern Fried Gal were easily to follow and worked out great. I have a couple more things to post about from the shower - hopefully I will be able to get them out soon. Have a great week!